In loving memory of our dearly departed @boarder42. Who shall forever remain in our hearts and minds as a champion for all who would maximize their investment returns by fully utilizing the advantages of fixed low-rate mortgages. I didn't interact much with Boarder42, but I will admit I got a good LOL from the "I FIRED by eating out every day" and related threads. I thought it might be fun to share what value he provided here on the forums, now that he's been banned forever. What, what, what?! Why is boarder banned forever? Wait is he dead or banned or no? He's usually been a very fun member to interact with. Thanks for posting the ban link. That's too bad. Despite the abrasiveness, which might have been reigned in with a warning, boarder provided a lot of value (and humor, for those who can sense humor online; from the Mustachian Sacred Cows thread, a lot of people can't). Bummer, going to miss him around here. He was perma-banned September 29, 2018, around 6:30PM. But people don't change their minds about things often. I'm kind of in the same boat. I found him very abrasive at first, but he makes a huge point that many completely discount. I used to be in the opposite camp but have completely flipped. I've tried my own "lighter touch" on a few occasions, but who knows if that will change any minds. The advice being pushed as 'always correct' wasn't if you happen to live in a country other than the US. It was certainly frustrating to see country specific advice constantly dogmatically given out over and over without acknowledgement of that fact. "Given you have access to spherical long-term, fixed interest rate loans in a vacuum..."
Seriously? I thought he had a lot of good insight. I didn't agree on everything, but he gave me a lot to consider which has helped me determine the direction I want to go. Sometimes it seems the moderators have a strong sense of "judge, jury and executioner", based on what they feel is right or wrong. I don't like boarder42, but they shouldn't be banned. I will admit I got a good LOL from the "I FIRED by eating out every day" and related threads. This might have gone over some people's heads, but I'm pretty sure those threads (the eating out and buying a truck ones) were not meant to stand by themselves as a lighthearted thing - they were created specifically to mock people who pay down their mortgages. Frankly I don't think it makes for a good atmosphere in a forum when people do that sort of thing. It creates a bullying atmosphere. Imagine if you created a thread in this forum, and someone created another thread to parody you, and imagine every forum member is allowed to do that without repercussions - I don't think that would make for a pleasant environment. I feel parodying other forum members is pretty mean-spirited stuff but looking at the responses in this thread, I guess I'm in the minority with that thought. I guess that's why I don't hang out in the main section of the forum much anymore, if so many people here think it's okay. Shrug. This might have gone over some people's heads, but I'm pretty sure those threads (the eating out and buying a truck ones) were not meant to stand by themselves as a lighthearted thing - they were created specifically to mock people who pay down their mortgages. Frankly I don't think it makes for a good atmosphere in a forum when people do that sort of thing. It creates a bullying atmosphere. Poor taste perhaps, but to call it bullying seems a bit excessive. I've seen quoted posts from other parts of the forum in the "Antimustachian Wall of Shame" board, and no one was excommunicated. I think that's in the same vein of shaming. It just concerns me if we start removing opposing views from our sound space, and soon we become an echo chamber that has no alternative points or thoughts. Suddenly we become my weird uncle's Facebook page. In these specific examples, the posts were mainly trolling and a joke. Things went a little overboard, even though it was very funny. The opposing views were allowed in every area except for the payoff celebration thread. I don't like those posts either... though I think actually making a thread takes it to another level. I think if you want to give someone a face punch just doing it to their face is enough... lol. No need to double up elsewhere, mocking them somewhere else where you're no longer addressing the person directly but they can still see it, just doesn't seem cool to me. That's like if you're hanging out with your friends and are deliberately saying mean things about another person who happens to be in the same room and within earshot but not part of your clique, and you're talking about them loudly flaunting how mean you can be and relishing it. If you think that's fine, I guess we'll just have to agree to disagree. Especially since rates in the US are going up and will probably be in the 5% range sometime next year. The math looks less appealing the further it goes. I never said it was fine, in fact, I said it was in poor taste. I don't think it constitutes bullying though, and that is what I stated. You are making both ad hominem and straw man arguments. I would be interested to hear a moderator's response, mostly out of curiosity more than anything. I agree with the above. I think you can offer good sound advice and provide the math to back up your claims. But you should leave it at that. I think Boarder perhaps took it a bit too far when he started mocking people who's mind he was trying to change. Dang. Dude was annoying but added some solid insight. He convinced me to stay the course and keep my mortgage to term. Just found out abkut this. B42 could be an arrogant at times, never thought he'd be banned. Must have made personal attacks. He just crossed the 1 Million mark recently. He's banned but at least wealthy. I feel parodying other forum members is pretty mean-spirited stuff but looking at the responses in this thread, I guess I'm in the minority with that thought. I guess that's why I don't hang out in the main section of the forum much anymore, if so many people here think it's okay. Shrug. Certainly personal attacks go too far, and the MMM-style facepunch parody may have been used a bit aggressively. The main section of this forum has unfortunately lost a lot of long-term MMM members. Boarder at least tried to bring some financial sanity back to it. Eh, I'm not sad he's gone. For several months now I've skipped past his comments, and responses to his comments, whenever I see them. He seemed unable to make a post that didn't express aggression or contempt, and he usually made it very clear that whoever he was responding to was an idiot, either expressly or very heavily implied. There are plenty of other people on the forum who can and will say that typically, paying off a mortgage early is not optimal, and they can say it more respectfully. There was some pretty serious trolling going on. I was reading through that thread just recently not knowing he had been banned yet and was surprised when I got to the point where the moderator said a lot of posts were deleted. It was bad enough trolling with just the posts that remained - so I apparently missed the worst of the trolling due to the deletions. I remember boarder was all over the mortgage stuff and didn't like it when I made a reference to a "one trick pony". Oh please, that dude compared the death of a spouse to stepping in a puddle of water and getting your shoes wet. I'll miss him like I miss a good case of chlamydia. I like boarder, but he clearly went waaaaaaaaaaay beyond what is normally tolerated around here. A lot of it was performance art (at least I think it was), but he pushed the bounds pretty hard. Yes I got that similar impression. Shock value I suppose. Silly thing is, he acknowledged it took himself a long time to come around to the view that paying off a mortgage early was bad. The disconnect was that he didn't permit anyone else to "take their time" coming to that conclusion too. I thought he was insightful, ironic and funny. There was an energetic and very opinionated quality to his posts and at times he was aggressive, but I guess I never read the threads where he would attack people. I thought Border made some great points. For me, Boarder was one of the few long time posters that doesn't just hide in the journals chatting with their besties. I liked this forum better in the early days when it felt like a single dynamic city, where everyone was out on the street and it was one big street party. Now it's groups of 3 or 4 people telling inside jokes, around a table at different suburban homes. Perhaps more people wouldn't hide in the journals if the main area was less snipey. I've thought about posting a thread in the "share your badassity" section before, but decided not to because I don't want to deal with people telling me that my post doesn't belong there. The concept of a forum being like a street party is great, too bad the fact is street parties can also turn into brawls, and some of us prefer to have less drama in our lives. You want everyone out on the street? Make the street a better place to be. I didn't get along with him all the time, but I'm sorry to see him gone. Like several others here, I credit boarder42 with actually convincing me to go from running numbers about mortgage paydown vs not to actually biting the bullet and going from paying a bit extra each month on my mortgage to just paying it down on schedule over the next 25-odd years. @APowers thank you for posting this thread. A lot of names I've been reading for years and years just disappear and it can take months to realize they're never coming back. It feels better to know what happened somewhat contemporaneously with when it happened. I'm betting I did a well. Good to be in such fine company! I still enjoy the energy in the DPOYM club. Boarder and I constantly debated the proper way to calculate rate of return for PMI, and he never convinced me of his position there. He was very good about acknowledging the limits of DPOYM rather than just being dogmatic. I intend to keep that thread going. Not paying down your mortgage lacks the [short term] tangible victory of seeing the numbers move. It's good to have a place to celebrate following the big picture plan even when that means not fiddling with things. Throwing in my hat in the ring that B42 took me from a Dave Ramsey mindset (without understanding that even he says to keep the mortgage) to a max liquidity mindset. I have more in equity than in my emergency fund (still), but it is much better now than it was a year ago. It was B42's math and input that showed me exactly how risky that path is. If the "Kill all the debt" folks would explain the drawbacks to their decisions, B42's input wouldn't have been needed, but they never do (that I have seen). After reading the main forum for a year they become reruns - the same stuff over and over. The journals interest me more at this point. If I had a specific question on personal finance I would probably turn to the Bogleheads - they’re sharp with numbers. I won’t miss Boarder - he was unnecessarily rude. His profile says he was on today, so he can probably see all this. He's probably reading this right now from the forum here after. He went to live on a farm upstate. Happily, that farm has a thirty year fixed mortgage. I wonder if perma-ban is better or worse than a 'viewing mode only' perma-ban. Where you can see bad math decisions being made but can't do anything to comment to stop them! Almost fits the bill for 'cruel and unusual punishment'. I wonder why he doesn't just create a new user, using a VPN if necessary. He may at some point. But online reputation is a tricky thing and folks with four figure post counts often have distinctive writing styles and ticks. If I was banned and had to start over from scratch, while haivjng to be careful to not sound too much like myself I am not sure I would be motivated enough to try to overcome that. A shrewd poster would create a fake account now (through VPN) and comment sporadically to establish a lengthy baseline of existence, then when banned transition fully into that account. Since it existed pre-ban, one can argue that it is not the banned party. Boarder42 had a good point that he relentlessly beat into the ground. I have limited sympathies. He was the Christopher Hitchens of mortgage paydown - fundamentally right, but such a jerk about it that he inadvertently convinced people to pay them down instead. twig21 - 21 is 42 divided by 2! 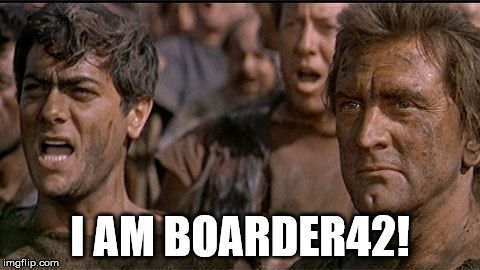 Boofinator - "boarder42, thanks for giving me the impetus to join this forum." Account was created one day before the ban. I demand a full and unrestricted background check into these new posters!! !